We photographed Sir Arthur Foulkes with his wife, the enchanting Lady Joan Foulkes, on location at Government House. We got there early, having requested a full hour ahead of time to set up the equipment and do our usual test runs. Lady Foulkes popped in to meet us and see how things were going. They were going very well. Amiable and welcoming, she put us at ease as we casually briefed her on what we had planned. In November 2012 our small group – which included Amanda Coulson, the director of The National Art Gallery and Diane Phillips, our public relations expert – paid a courtesy call on Sir Arthur Foulkes. “This is a wonderful idea,” he said when we told him about the Bahamian Project. We showed him the photo we had taken of Peanuts Taylor – an intense study in black and white. “Look at the quality of the work,” said Sir Arthur. It was during that courtesy call that the seeds were sown for this photo session. Arthur Alexander Foulkes, born in Inagua in 1928, is the current and eighth Governor-General of the Bahamas. 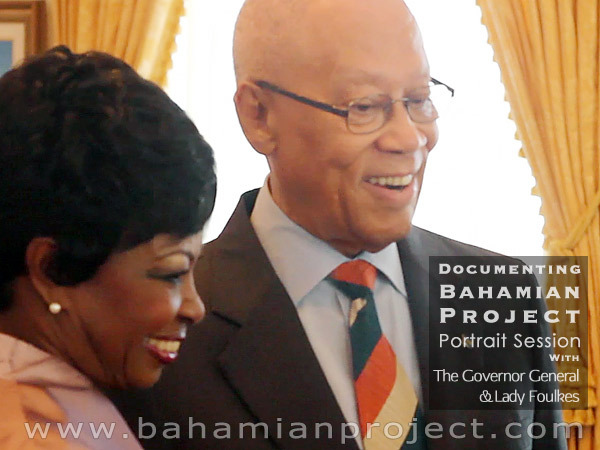 He is one of our original nation-builders and has contributed immeasurably to the foundation of our Bahamas. He has played an important role in bringing about political and social change in our country. Sir Arthur started as a young journalist in 1948. He was a reporter, and then editor at The Tribune until 1962. From 1963 until 1967 he was a founding editor of the Bahamian Times, a newspaper which played a pivotal role in the movement toward Majority Rule. Sir Arthur was one of the key players leading to the formation of the Progressive Liberal Party (PLP). He became known for his impassioned speeches and in 1967 was elected to parliament where he served the PLP Government in various political offices over the years including Minister of Communications and Minister of Tourism. Later, in 1971 he helped to form a new party – the Free National Movement. I could go on and on about Sir Arthur’s illustrious career and noteworthy achievements but I think Hubert Ingraham summed things up quite well when Sir Arthur was being sworn in as Governor General in 2010. “Your love of country, dedication to duty make you a most deserving Bahamian son to occupy the high office of Governor-General,” said Mr. Ingraham, then prime minister. Lady Foulkes, a gracious woman of unsurpassed elegance, has stood by her husband through those years. She is the great woman behind this great man. She is known for her compassionate and giving nature, particularly when it comes to children and charity work.